We compare the India bound Range Rover Velar’s specification details against the competition. To slot in the large gap between the Range Rover Evoque and the Range Rover Sport, Land Rover has introduced the Range Rover Velar. The Velar will be launched in India soon so we take a look at how the Velar fares on paper against the Mercedes-Benz GLE, BMW X5, and Jeep Grand Cherokee. In terms of dimensions, the Range Rover Velar seems to be the smallest vehicle of the lot. The BMW X5, however, is the largest vehicle offering as it is longest, widest and has the longest wheelbase. The Jeep Grand Cherokee however, is the tallest standing in at 1.8 metres high. 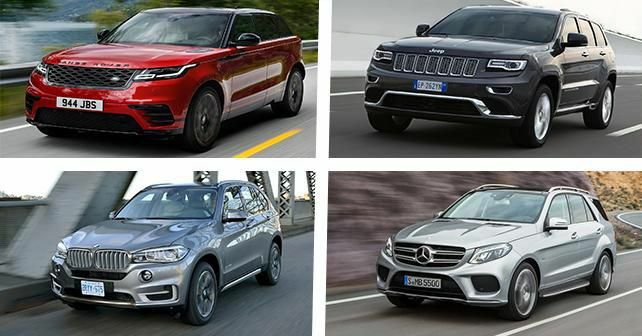 When it comes to engines, these large SUVs are mostly chosen by India consumers with diesel engines. All these cars are offered with six-cylinder turbo diesel motors. However, Mercedes-Benz has included a 4-cylinder turbo diesel engine as well. At the moment, Land Rover has not confirmed what engines will be offered in India officially, Though looking at the completion, similar options are expected to be offered in India. Comparing the six-cylinder diesels, all cars are quite similarly matched. All four SUVs have nearly the same amount of displacement, and all but the BMW are single turbo V6 units. The engine in the BMW, however, is an in-line six motor with twin-turbo forced induction. The Velar, X5 and the Jeep come with 8-speed automatics, Mercedes offered the GLE with their in house developed 9-speed automatic gearbox. While the Jeep is the only car among the four which is an actual 4x4, All others only come with different tuned and sophisticated all-wheel drive systems. When it comes to power outputs, the Velar seems to produce significantly more power than its rivals as the Ingenium motor churns out 296bhp and 700Nm of torque. Here is where the jeep loses out as its V6 can only develop 236bhp, however it is the X5 with the lowest torque output. The smaller diesel options of the Velar and the GLE seem quite different on paper. While the Range Rover Velar comes with a 2.0-litre engine the Mercedes GLE has a slightly larger 2.2-litre motor. Gearboxes on both SUVs are derivatives from the larger six-cylinder engines. But looking at the numbers, it is the Mercedes that out performs the Velar in this case as it develops more power and more torque. Land Rover is yet to announce the prices of the Velar, however, due to its size and engine options, it is likely to be around the same ball park as its completion, albeit, at a slight premium. Currently, it is the BMW which seems to be the most reasonably priced of the bunch, as the X5 is offered in a number of trim options, though it only comes with a larger engine. The Jeep Grand Cherokee is a little steep, especially when it comes to value on offer for the money. But with a smaller engine on offer, the GLE underscores its completion with the most affordable 250d 4MATIC variant.